Description: BRRTools are currently the most evolved tools to convert between Microsoft standard WAV format and SNES's compressed BRR format. * -sb#### will resample the audio file to approximately #### Hertz. Passing -g to brr_encoder will prefilter the audio file to compensate for SPC700's Gaussian filtering (muffling). Passing -a### will multiply the loudness by ###. To fix clipping, try passing -w -a0.99 (or smaller) when using resampling or -g.
Note that loop points still have to be manually inserted into the output BRR files to make them usable with Addmusic. Changed the internal calculations to operate on 32-bit samples (instead of 16-bit WAV samples). -g and -rb often increase signal amplitude and produce clipping. 32-bit samples ensure that clipped samples saturate, rather than producing loud overflow/wraparound artifacts. As with the previous version, I've only done testing to assure general functionality and haven't tested every single feature, since I'm not experienced with music and porting stuff. This version was also missing the Readme, so I went ahead and included the Readme from the previous version. 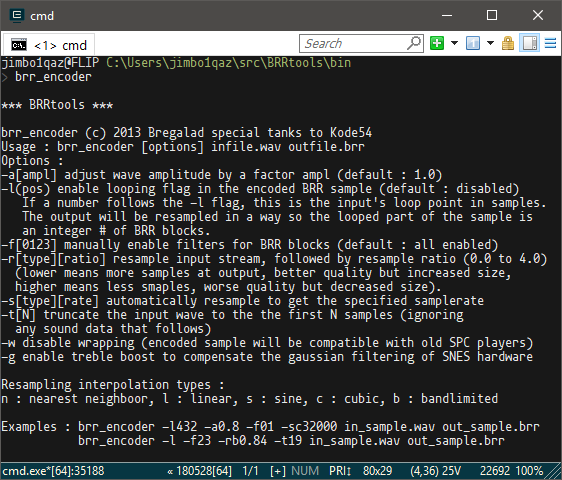 MOD NOTE: Should I modify brr_encoder to output AMK loop header (if passed a flag), and modify brr_decoder to read +skip the loop headers if present? Feel free to do so and submit an update, it would definitely make it more useful for SMW hacking purposes. If you do so, I recommend enabling it via a new command line parameter for the executables. Also if you do, make sure to update both the encoder and decoder to work with the new .brr format. So, there is no way to setup an automatic loop finder or something? Replaced with msys2 mingw32 build. Should work on 32-bit OSes (but I haven't made sure). EDIT (2018-06-22T07:08:32+00:00, Fri, 22 Jun 2018 07:08:32 +0000) I previously uploaded a 32-bit build of the unfixed source, by accident.